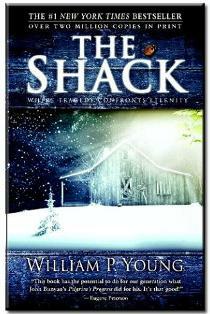 Described as a Christian novel, The Shack, written by William Paul Young, sat on the New York Timesbestseller list for over 172 consecutive weeks (including 52 weeks at #1), and over 10 million copies of the book are in print.1 Many Christians have purchased multiple copies and given them to friends and family. LTRP Note: The author of the article below, Jennifer Pekich, is the same “Jennifer” talked about in A “Wonderful” Deception on fractal theory in the best selling book, The Shack. I finished reading my copy of William P. Young’s, The Shack, and had something happen that I want to share for those who are interested. While reading The Shack, I rented a movie that came out last year that also, like The Shack, involved some controversy. The movie was called, The Seeker, and it’s based on a book titled, The Dark is Rising, by Susan Cooper. The Seeker was said to have New Age undertones and was also, like The Shack, being marketed to Christians. Because of my interest in cults and also in the New Age movement, I decided to watch the movie to see if indeed the claims were accurate. This is where it began to get interesting. In the movie, The Seeker, a young boy is a chosen one who is to find signs hidden throughout time, which will help fight against the encroaching darkness. I won’t go into the plot too much but what I will say is, in the movie, each sign that the boy is to find is known as a “fractal.” When I heard the term “fractal,” right away I realized that I had heard that same term somewhere else recently. Later on that day I remembered where I had heard it … The Shack. Beginning in Ch. 9 in, The Shack, which is titled, “A Long Time Ago in a Garden Far, Far Away,” we read about how the character Sarayu (who represents the Holy Spirit) has created a garden, and we learn on page 129, that the garden is a “fractal.” We learn about fractals from Sarayu when she says, “A fractal is something considered simple and orderly that is actually composed of repeated patterns no matter how magnified. A fractal is almost infinitely complex. I love fractals, so I put them everywhere.”  Then we continue reading through the rest of Ch. 9, which is filled with ideas that are not only relativistic, but are also panentheistic, which means that God is in all. After noticing that “fractals” were mentioned in, The Seeker, and in, The Shack, and remembering that the movie and the book were touted as having New Age undertones, I decided the common term found in both was a coincidence that needed to be further explored. I began to read many critiques about, The Shack, to see if any of them mentioned the significance of the word “fractal,” only to find that none of them approached the subject. So I decided to do a search on the Internet using the words “fractal” and “New Age”… bingo!!! So, how do “fractals” or “Fractal Theory” play into the phrase “As above, so below?” In New Age thought, “Fractal Theory” and “As above, so below” are synonymous. They attempt to explain the origin and meaning of the universe. “Fractal Theory” says that in looking at the big picture of nature, we see an evolution of consciousness from small systems of consciousness, to progressively larger and more complex systems of consciousness. Basically, conscious beings are like fractals evolving to ever greater scales of magnitude. Along the way, we follow the same basic patterns, but at each stage of consciousness we find unique variations in this evolving process. These variations can easily lead to confusing chaos if you don’t know the underlying patterns, or “fractals,” which are the basic laws. New Agers say if you know what to look for, which are the key fractal structures, it’s analogous to looking beyond millions of individual trees and realizing that what you really see is a forest … the unity behind the great diversity of nature. To sum it up, “God” is both our origin and our aim, thus the core belief of the New Age movement which says we need to have a self-realization that we are all gods. Another interesting fact about the New Age phrase, “As above, so below,” which is synonymous with the term, “fractal,” in New Age thought, is that it’s also used in the popular paraphrase of the bible known as, The Message, written by Eugene Peterson. In, The Message, Matthew 6:9-10 where we find the Lord’s prayer, it reads, “Our Father in heaven, reveal who you are. Set the world right, do what’s best – As above, so below.”  Eugene Peterson’s recommendation of The Shack, is found not only on its front cover, but also on it’s first page beneath where it says, “What others are saying about The Shack.” Peterson’s comment states, “When the imagination of a writer and the passion of a theologian cross-fertilize the result is a novel on the order of The Shack.”  I disagree and would suggest that what’s being “cross-fertilized” is a biblical world view with a New Age world view. After studying New Age philosophy by breaking out my old copy of Kingdom of the Cults, by Dr. Walter Martin , going to the library to check out a New Age book titled, As Above So Below, by Ronald S. Miller, and continuing to scour New Age sites on the Internet, it became obvious to me that The Shack is filled with New Age thought and Eastern mysticism. I did not come to this conclusion by reading critiques, but found it by doing my own homework. It is my opinion that somewhere along the way, William P. Young has been deeply influenced by New Age thought. This naturally leads to my next question … is William P. Young a New Ager, or is he himself a Christian who’s been deceived? I have no way of knowing the answer to that question, but what I do know is, after all of my studies, and listening online to William P. Young speak at Mariner’s Church , along with reading The Shack for myself, what Mr. Young teaches when he speaks, and the message his book conveys, is not orthodox biblical teaching, but in fact is New Age thought and Eastern mysticism interspersed with some Christian terms. discern good and evil, error, get oil for your lamp, jacob Prasch, kry olie vir die lampe, THE HINDU god's OF "THE SHACK"-JAMES JACOB PRASCH-, The Message Bible & Purpose Driven. Warren Smith, The Shack and Its New Age Leaven, The Truth behind The Shack, Warren B. Smith, wees wakker. Bookmark.